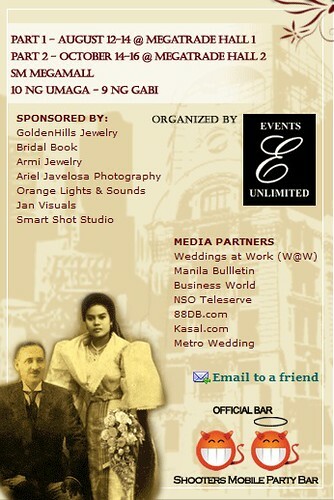 You are invited to the KASALAN 2011 PART 2 Bridal Fair! Yeah I know it's Monday again. But for those who's having their usual Monday blues, don't be sad because there's something to look forward to for the coming weekend: MALLWIDE SALE! haha. And for couples who are planning to shop at SM Megamall this coming weekend, I'd like to invite you to visit my booth at the KASALAN Bridal Fair at the Megatrade Hall from Oct 14-16.